When you’re on a low carb diet there are a number of foods that are simply not on the menu. Pasta is a prime example. And that really hurts! You can, of course, replace pasta with spiralized vegetables. So, instead of spaghetti you can serve that tasty pasta sauce with courgetti. But what if you just want pasta? Or something with similar consistency to the pasta that used to be a staple of your cooking? There are a few products that you can get that are low carb versions of pasta and other things that ordinarily wouldn’t be compatible with a low carb diet. Unfortunately they’re not readily available in supermarkets near where I live. However for the last couple of months Aldi has been stocking a number of “alternative” pastas, which are aimed at the gluten free market. They are, however, all low carb, so they’re a very good substitute. It’d be great if these were stocked with the “normal” pasta and other products, but for now at least they’re available, even if they’re in the “special buy” sections. So what are they like? I’ve tried most of them over the last couple of months and overall I think they’re pretty good. Sure the taste isn’t exactly the same as pasta and the consistency is a little different, but if you’re yearning for a pasta dish and want to stick to your low carb regime they’re a viable option. In terms of preparation they’re basically the same as pasta. Boil water, add salt if you want and chuck the “spaghetti” in and let it cook for about 4 minutes. Drain and serve. The one thing you will find, however, is that the spaghetti is both a lot shorter than normal spaghetti and also quite a bit more brittle, so you can easily end up with broken bits – though that obviously doesn’t impact the taste. Their consistency is also a little odd so when you’re trying to weigh out the right amount it can be a bit of a struggle getting them out of the pack without pulling out the entire packet’s contents at once. Verdict? 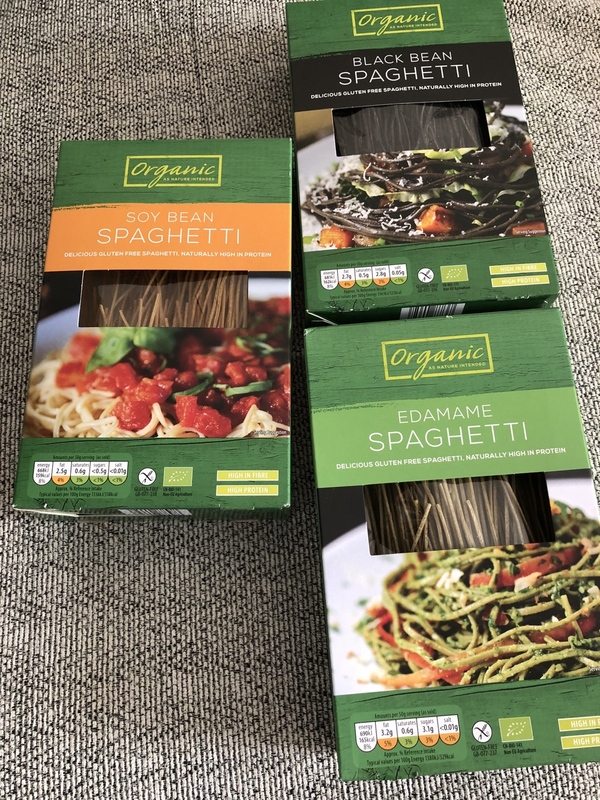 They’re perfectly edible and as long as I can get them easily in Aldi I’ll be able to add “pasta” back to my menu, which is very welcome indeed! While I enjoy cooking I’ll be one of the first to admit that I avoid complicated recipes. If it involves magical incantations it’s not going on the menu. If it involves ingredients I can’t get locally or online then it’s off the menu. Recently, however, I’ve been trying to get myself out of my “comfort zone” a little by trying something different most evenings. Over the past couple of weeks those experiments have been partially successful and partially not so successful. I haven’t had any complete failures, as that would have meant ending up without anything edible! 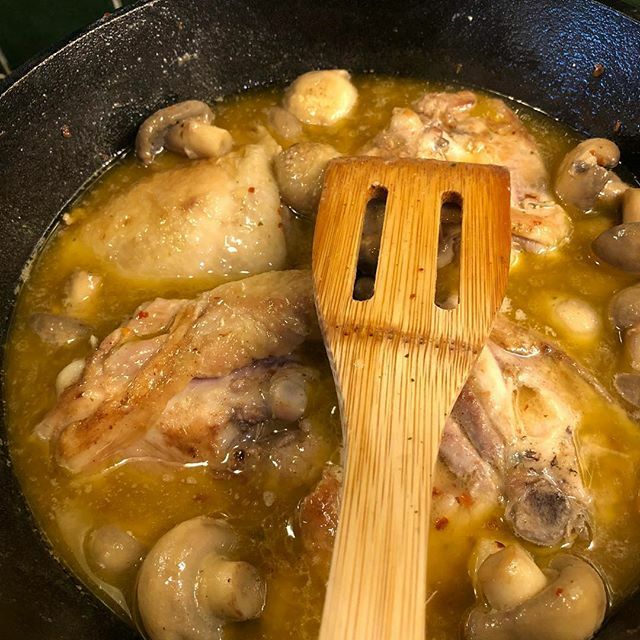 One of the local supermarkets has been offering very cheap chicken thighs, so I ended up having chicken several nights in a row. 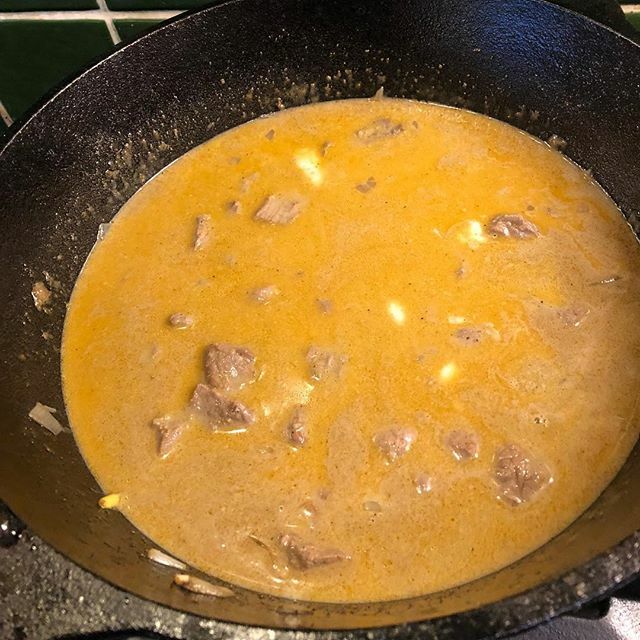 However after a few days I had to vary it a little, so I switched to beef then lamb. I also generally swap specific types of stock or broth for a vegetable stock which I always have some of in my kitchen cupboard. Similarly I’ll often use frozen spinach instead of fresh as it’s nearly always on hand in the freezer. If a recipe only calls for one or two cloves of garlic I’ll probably double the quantities. So what did I try cooking? 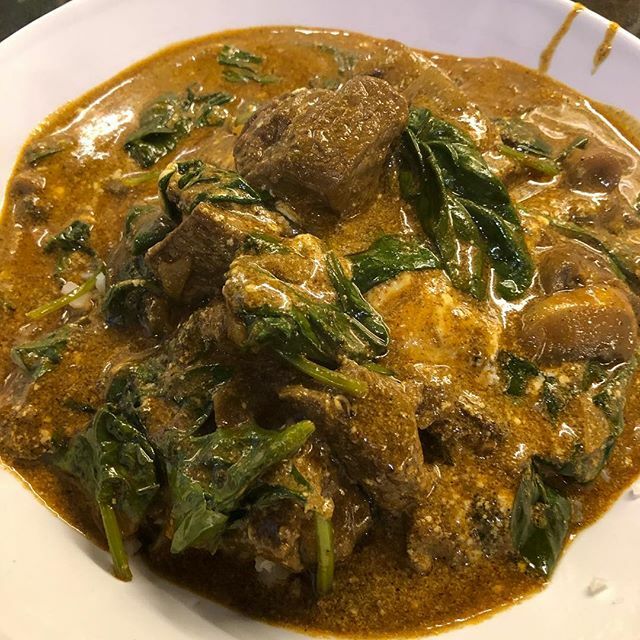 Lamb Curry with mushrooms and spinach: This one was very easy to make and the results were very satisfactory. The only issue I ran into was that the sauce didn’t reduce enough and so it was a little bit too liquid for my liking. 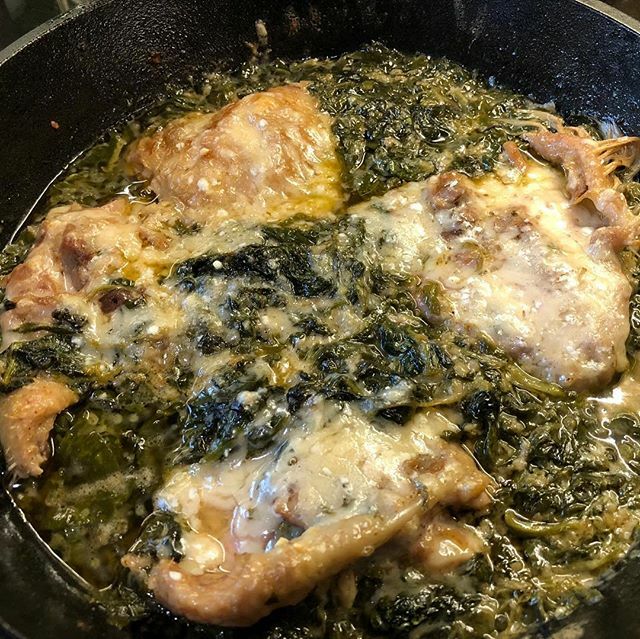 Keto Lemon Butter Chicken Thighs: definitely one of the better options I’ve made recently. It was very tasty. One of the things I’ve found very handy is cooking in cast iron cookware that you can take straight from the ring to the oven without having to mess around. Of course cleaning it afterwards can be a pain, but so be it. 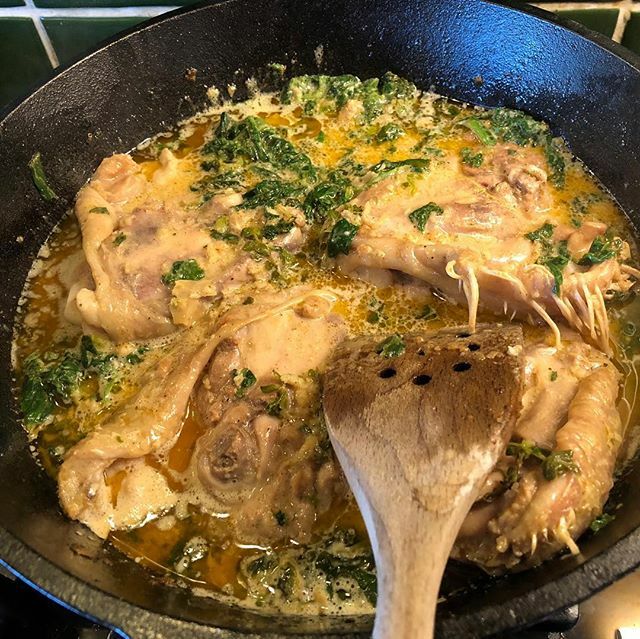 Keto paprika chicken thigh bake: simple and tasty. 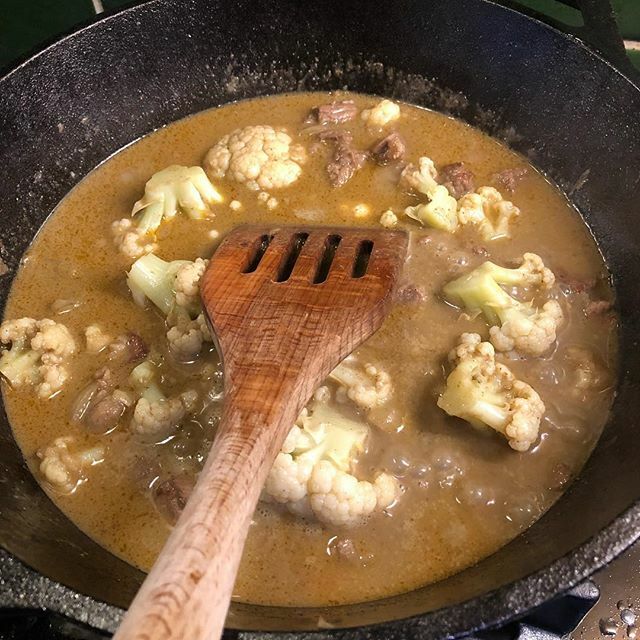 The key thing for me was finding “interesting” recipes that made dinner that little bit more adventurous, but without getting stuck dealing with overly complicated instructions or impossible to find ingredients. 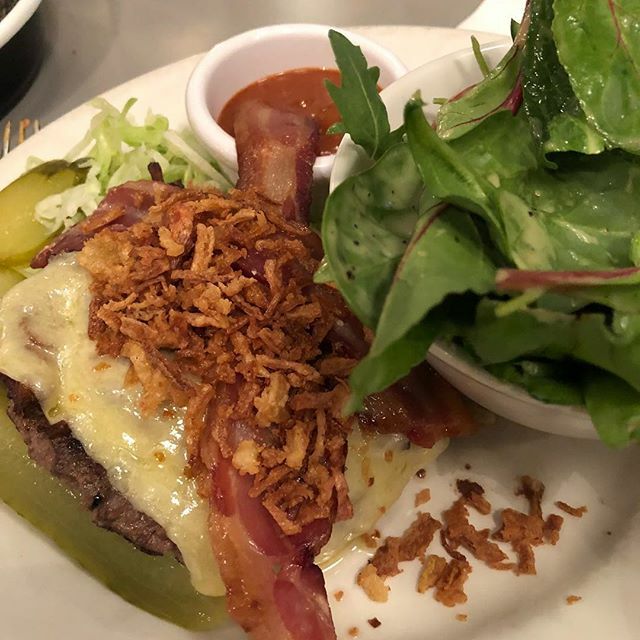 Back in January I posted about having a low carb burger in LA. This weekend I’m in London, which, while packed to the gills with restaurants, probably isn’t famous either for burgers or for low carb options. A couple of minutes walk away from Leicester Square I came across Byron. They’re a burger restaurant chain that offers a very interesting take on the burger. I’ll admit I’d never heard of them, but after checking out their menu I thought I’d give them a go. Why? Because they offer a “skinny burger”, which is the burger served with salad on the side, instead of in a bun. Overall it was excellent, though their salad dressing wasn’t exactly “amazing”. Service was fast and friendly and the setting was nice and relaxed. The other plus was that there wasn’t a massive queue to get in and get a table, while a lot of places around Leicester Square proper had massive lines. Well I enjoy eating out when I’m travelling and I like to be able to order directly off the menu. I don’t like having to negotiate with a restaurant’s waiting staff in order to get a version of a meal that will work for my diet. Eating out when you’re on a diet can be a challenge. It’s one of the reasons why I find the low carb diet to be easier to follow than others that I’d tried in the past. I’m not going to pretend that I can control what I’m eating perfectly when I eat out, but when your main concern is avoiding carbs then it’s a lot easier than when you’re trying to get a balance of many other things. One of the things I like about Los Angeles, where I’m currently spending a couple of days, is that it caters for pretty much any taste. I love burgers, but most places in Ireland and most of Europe insist on serving burgers in buns and serve them with a mound of fries. In the US, however, you have chains like The Counter where you can easily choose burgers without buns. 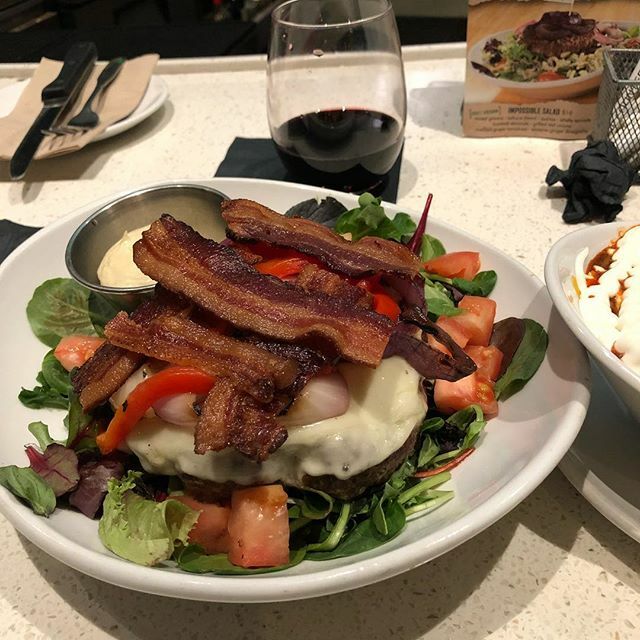 I nearly always opt for their “build your own” burger menu, where you get to choose pretty much every single element that goes in to it. So you can make it as bland or as spicy as you want. I opted for their bison meat with cheese and bacon to top it off, served with a garlic sauce on the side. Absolutely out of the world and very low carb overall. Unfortunately I am yet to find a restaurant that clearly caters for low carb diners, though it’s hardly surprising. While the low carb diets are becoming more and more popular they’re still not as mainstream as others. 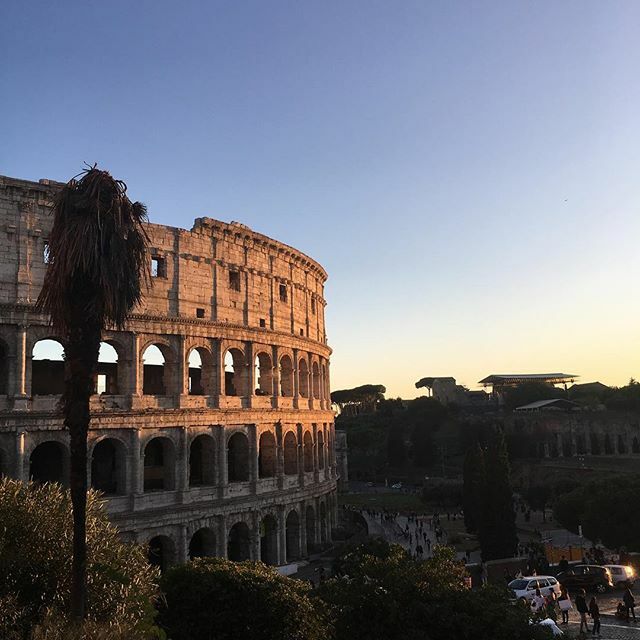 I got back from Rome yesterday where I was attending a business event. 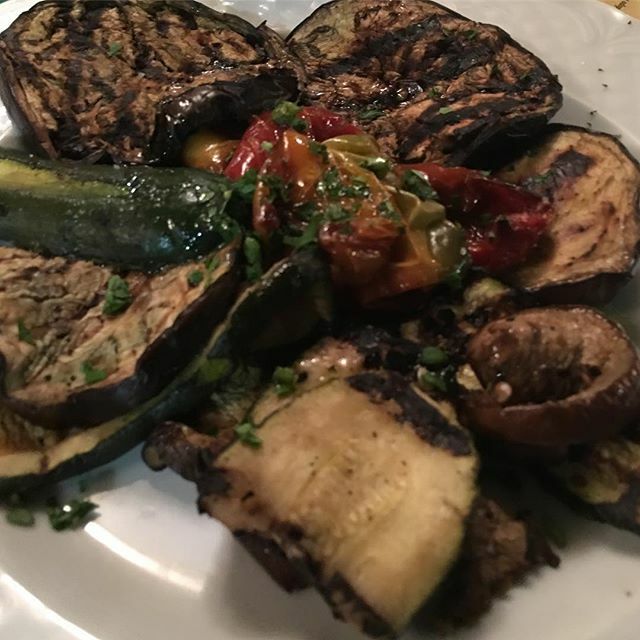 Italian food is wonderful, but most of the staple dishes you think of when you think of Italian cuisine are simply off the menu if you’re going to stick to a low carb ketogenic diet. When you’re going low carb you can’t have pasta, pizza or bread. So you’d think that a trip to Italy would be absolute torture. Well you’d be close to the truth. It wasn’t torture, but it definitely was more painful than the trip to Stockholm a couple of weeks ago. 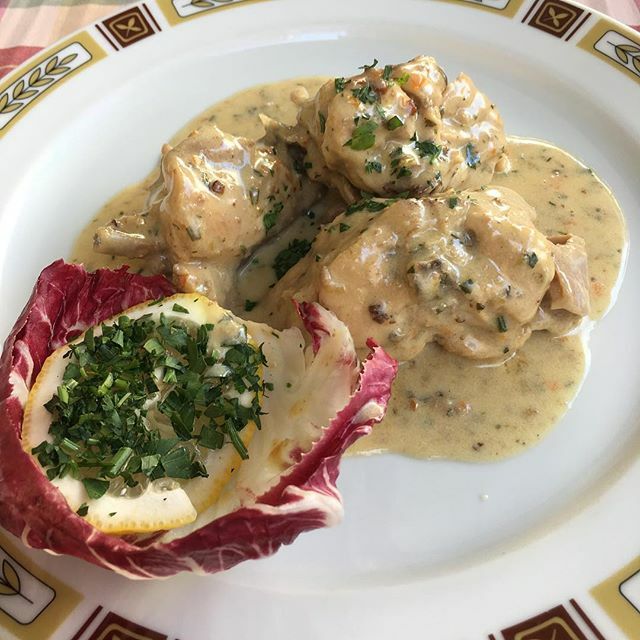 Everywhere you look in Italy there is amazing food. You walk down the street and you can literally smell it as it wafts from the many cafes, restaurants and pizzeria with outdoor seating. However it is possible to eat out in Italy and avoid carbs. It just requires a bit of mental discipline. I simply refused to succumb to temptation. I could have misbehaved, but I was afraid that once I started down that route there’d be no turning back. So what did I eat? 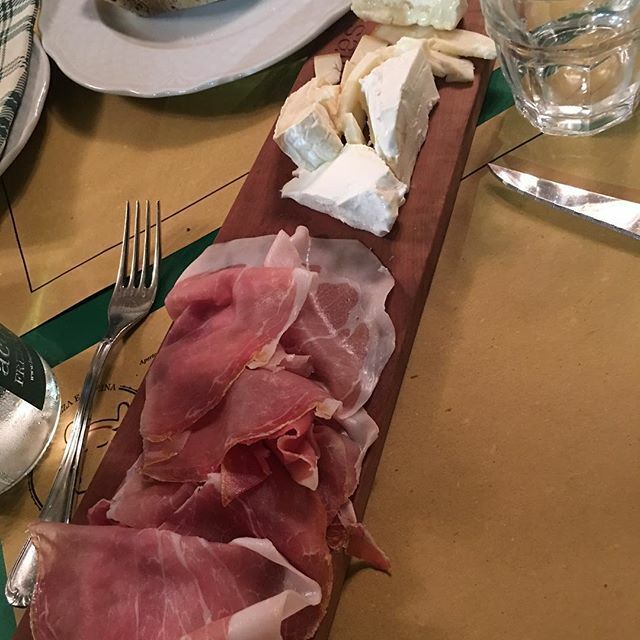 Cold meat, such as prosciutto and salami is on the menu in pretty much every restaurant in Rome. There’s probably a point in time where you feel you’re going to turn into a slice of ham, though I’ll freely admit that if that’s my fate so be it – it’d be a nice way to go! Luckily there’s also cheese, because I don’t think I could have survived without it. Of course vegetables, both raw (as in salads) or cooked in a variety of ways help a lot. 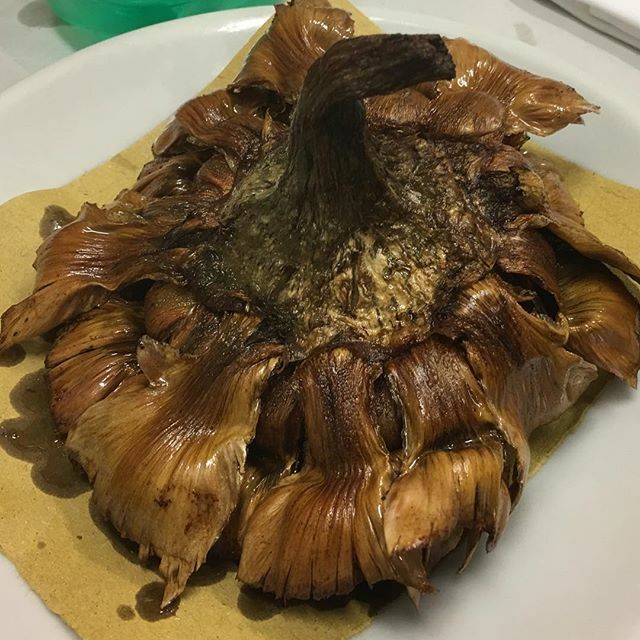 One Roman delicacy is artichoke, which was absolutely delicious. Unfortunately it’s pretty heavy in carbs, but I suspect I still managed to stay under my daily allowance. Overall the trip to Italy was fine in terms of me “behaving”, though I definitely struggled more to stick to the regime I’ve imposed than I did when I was in Stockholm. Now I’m back home for a few days I can control my environment and my diet more easily. The next trip on the agenda is to Brussels, where the main temptations will be chocolate and beer. Two of my favourite things! I’m now 3 weeks into this ketogenic low carb diet. So far it’s going quite well. Sure, I still miss being able to eat bread, pasta and a bunch of other things. It’s not so much a craving, but a quite radical change to my eating habits. When you walk past a bakery, for example, the glorious scent of freshly baked bread and pastries is painful! Last weekend I cleared quite a bit of space in the kitchen cupboards by getting rid of pretty much all the carb heavy foods I had in there. There’s probably some more stuff that I could cull from there, but getting rid of all the pasta and rice has freed up a lot of space, as well as removing temptation. Shopping when you’re on a low carb high fat diet is a little different. It’s not drastically different unless you are used to a diet of processed foods, but you find there are entire areas of the supermarket that you basically skip over completely. Conversely there are sections in some supermarkets that you end up spending a lot more time in. It takes a little getting used to! Vegetables and fruit are important, but you have to avoid root vegetables and learn to love cauliflower, broccoli, kale and spinach. I’ve never been that big into berries, but since you can’t eat most other fruits you find yourself picking up packs of raspberries and blueberries regularly. As I mentioned recently, I’ve become a big fan of Aldi and their salad range. You can either use their protein or mix it up a little with things like tuna or other carb free sources of protein. Yesterday I went to the local farmers’ market where I was able to pick up some fresh and locally produced vegetables. A lot of the vegetables you get in the big supermarkets like Dunnes, Aldi, Lidl or Tesco have travelled long distances and been chilled and stored for days or weeks before they hit the shelves. With a farmers’ market you can be pretty confident that the vegetables came straight from the farm they were grown in that morning. The other thing is the shape and colour. If you’ve ever grown your own vegetables you’ll know they don’t always look as photogenic as the big supermarket chains have been trying to convince us. And that’s not a bad thing. One of my recent acquisitions was a Nutribullet. My thinking being that healthy low carb smoothies would help my overall diet. Getting recipes for a low carb diet can be a bit of a challenge, which I’ll touch on at some point. However yesterday I did manage to put together a couple of really tasty low carb smoothies. Why is this pertinent to shopping? The ingredients. 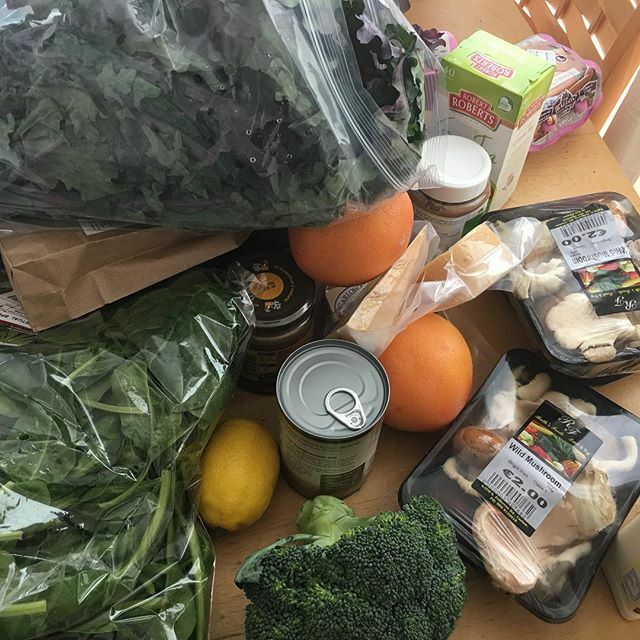 When you’re doing low carb high fat ketogenic diet you end up buying things like coconut oil, tinned coconut milk and avocados. You’ll also find yourself spending time in the health food aisles in search of things like chia seeds. 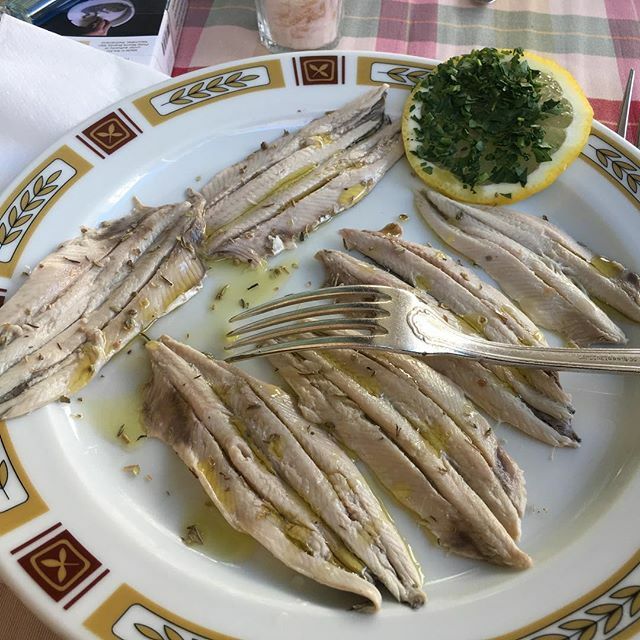 I’ve also found myself eating quite a bit more fresh fish than I used to. 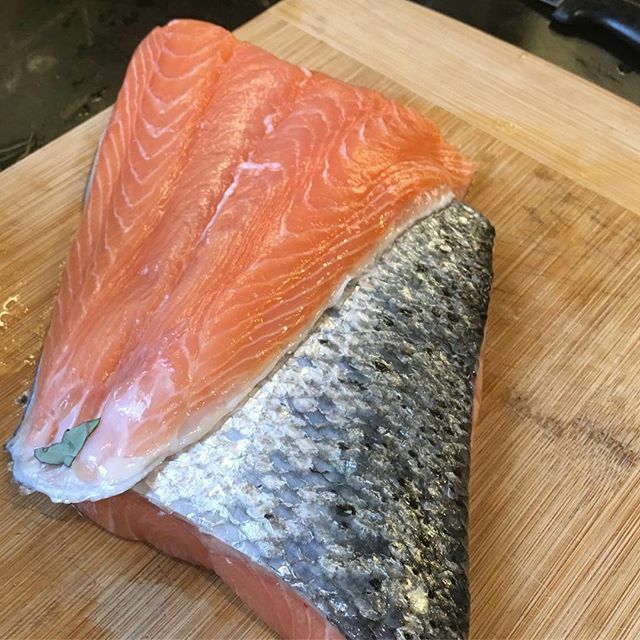 Salmon, trout and other fish are readily available in several of the local supermarkets and Carlow now has a fishmonger (Omega Fresh Fish Centre), which is a great addition. Yesterday I was able to pickup a couple of fillets of salmon and served them with some sautéed wild mushrooms. There are plenty of ways to cook salmon, but I like keeping things simple – lightly frying them in some butter does the trick nicely. But what about other low carb foods? Until I started on the ketogenic diet I rarely bought cream. I’d only buy it if I was planning on having some kind of dessert that would benefit from it and I’d often end up only using a bit and throwing out the rest after it went off. (Yeah I know, wasting food is bad, but chugging fresh cream is a little odd!) These days I’m using cream in a lot of things including my coffee in the morning. Some people swear by “bulletproof coffee”, but I honestly don’t think I could stomach something that filled with fat. Adding fresh cream to coffee instead of milk increases my fat intake without making it undrinkable. But when it comes to the smoothies, for example, you end up using things like almond milk, fresh cream and coconut oil instead of ingredients I would have used previously like honey or banana. Breakfasts often involve bacon and eggs if you want to keep it simple and 100% carb-free. To mix it up a bit you can always add in proper butcher’s sausages ie. ones that are almost 100% meat. Bear in mind that most sausages use breadcrumbs, oats or other carb rich ingredients to add flavour to the meat mix, so you need to check the nutritional information on the pack. Having bacon and eggs every single morning, however, gets kind of boring, so being able to get my hands on low carb granola has helped. A small serving of granola covered in my homemade yoghurt is a good start to the day and adds that much needed variety. I’d love to be able to find an Irish supplier, but so far I haven’t found one and have ended up buying it via Amazon. I could make my own low carb granola, but I simply haven’t got round to trying yet. Drinking lots of water is meant to be good for anyone trying to lose weight. So I’ve been trying my best to drink at least two litres of water per day, though I often end up drinking quite a bit of herbal tea in the evening instead. My “go to” herbal teas are things like mint and green tea. I really don’t like the taste of green tea, but I’ve been forcing myself to drink it as I know it’s beneficial. The key thing I have learnt over the last few weeks on the ketogenic diet is that you need to check the ingredients on pretty much everything you buy. You’ll be shocked to find out how many “innocent” looking items are packed with carbs. 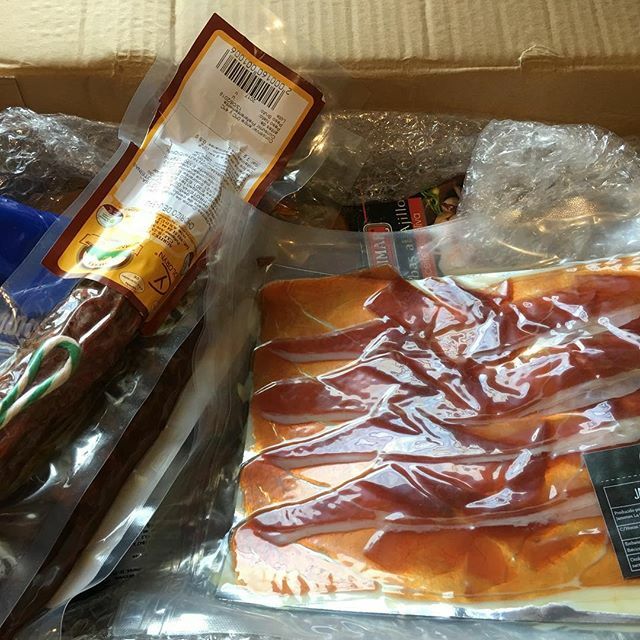 Spanish chorizo and cured ham. I don’t like wasting food. If there’s food in the cupboard it needs to be eaten at some point by somebody. However if you’re following a low carb diet you quickly discover that a lot of the food in the cupboard simply is not compatible. Flour? Not unless it’s almond or coconut. Alpen muesli? Nope. The dried fruit is high in carbs no matter whether you choose the “no added sugar” version or not. This weekend is a bank holiday here in Ireland, so I’m visiting family. So guess who gets to “inherit” all my carbs? So between Thursday evening and Friday morning I went through the kitchen cupboards and did a purge. Within a few minutes I’d managed to fill two reusable shopping bags with pasta, rice, flour, breakfast cereal and other carb-heavy foods. Taking the entire lot to my mother and sister means I know that they’ll get used and that is a lot better than having them sitting in my kitchen cupboards. I also think it’s a good idea to not have things hanging around that I simply won’t be eating. If they’re in the cupboards then they’re temptation at some level. If they’re simply not there then there’s no issue. Also there’s the practical issue of space. Getting rid of all this stuff freed up quite a bit of space in the cupboards, so I’ll have more space for the kind of food I’m eating at the moment. And while many of the things like pasta have quite long dates they do go off eventually. So when I get a delivery of ham, chorizo and other tasty keto compatible foods I’ll have space in the cupboards to store any of the tinned food, like the tuna in olive oil. Low Carb Snacks – What’s Available in Ireland?